This rare early harvest extra virgin olive oil captures the unique occasion when the very first olives of the new harvest are milled on the estate of Castillo de Canena. A result of the season's first 24 hours of milling, this special Arbequina extra virgin olive oil delivers intense flavors of almond, green apple, banana and a dash of pepper delight the palate, resulting in an excellent oil for cooking fish, preparing vinaigrettes and mayonnaise. First Day Harvest produces a more powerful oil that enhances the oil’s natural flavors and aromas. In addition, each year the label for the First Day Harvest oil is redesigned by a different prestigious artist creating a full collection of fine oils. This year, the author Juan Eslava Galán has created the new label, choosing to emboss two Roman coins from Imperial Hispania on the labels. For the Arbequina First Day of Harvest he has opted for the owl of the goddess Athena (known to the Roman world as Minerva) together with an olive branch. “Since time immemorial the First Day of Harvest has been an occasion for special celebration in the Mediterranean world of the olive tree. On this holy day, the Greeks consecrated the harvest to Athena, goddess of oil and wisdom, and with the olives collected by the joyful pilgrims they pressed the first oil, which was consecrated to the divinity: burned in the lamps of her temple and consumed in the ritual banquet of her adepts. This memory has been transmitted through all the diverse cultures that honor the olive, and reaches our times with the fervor and festivity of its origins," the writer explains. Located in the Guadalquivir Valley in the region of Jaen in the heart of Andalusia, Castillo de Canena is a distinct and unique family business involved in the complete process in creating extra virgin oils, from the trees and the land to its commercialization. Author and journalist, Tom Mueller, visits the Castillo de Canena Estate in his acclaimed book, Extra Virginity, and highlights the careful practices of the company. During the harvest, the olives are selected by hand at the perfect time, from specially selected trees before being carefully transferred to their mill. The olive trees are gently watered by 8 kilometers of the river Guadiana Menor, giving their oils a sweeter and less peppery taste and guaranteeing each yearÛªs harvest will be full of aroma and taste. Castillo de Canena takes great care of their olives and their land with a ''natural and environmentally respectful and integrated system'' and is certified on a monthly basis by official inspectors. 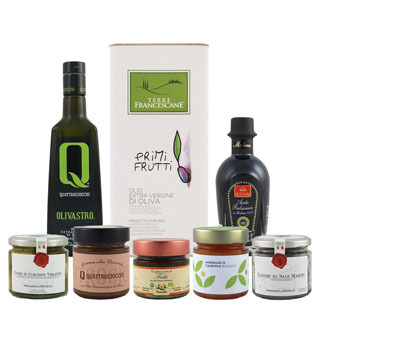 The company received the highest score of 98 points in the 2015 Flos Olei Guidebook and is consistently featured in the ''Top 20'' extra virgin olive oils year after year. A balanced, fruity oil with hints of banana, almond and light touches of ripe apple. A deep green oil with intense fruitiness of green olives, freshly mowed grass and tomato plants.